Where: On the Tiber river. NEW LOCATION @ TAG on via di Santa Passera 25, Roma. The bidding begins at 7 pm on Saturday, October 13th. Please note that the auction collection will be exhibited from Tuesday, October 9th – Thursday, October 11th from 3 pm to 7 pm at TAG in Rome on via di Santa Passera 25 for those who wish to view the works before the auction. Absentees: For those of you who cannot attend the auction, but wish you could, we will accept Absentee bids until October 11 at midnight. Absentee bids may be placed by sending an email, subject title Absentee Bid and indicating the Lot number and the bid to info@ilexphoto.com. If during the auction, no one has a higher bid, than your bid wins and the work is yours. @ 21 Doors open for our anniversary party. All welcome. Live music performed by Subba and the Roots followed by a DJ set. A Good cause. We are pleased to support the restoration of the Fontana del Navigante. A portion of the auction proceeds will be donated to the Rome onlus Spazio più Forma for the restoration of the Fontana del Navigante. Currently in disrepair, the fountain served as a lighthouse to navigators entering the city from the ancient Porto di Ripetta on the Tiber River. Elegant casual (as opposed to casual elegant). 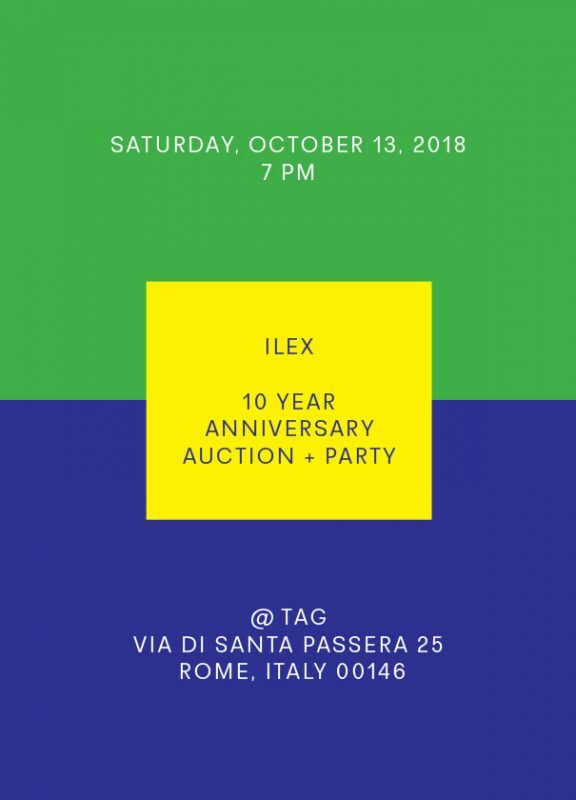 We hope that you will join us in celebrating ten years of ILEX!